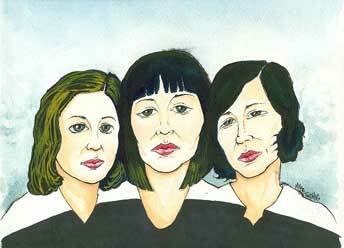 The three ladies of Sleater-Kinney do not fit the above descriptions. 2005 marks their eleventh year as a band, and through it all they’ve produced albums that are unique from one another, yet each distinctively recognizable as music that only Sleater-Kinney could create. With the release of their latest full-length, The Woods, Sleater-Kinney have boldly moved from the Kill Rock Stars label to Sub Pop, enlisted the services of a new producer, and, as described in my conversation with guitarist/vocalist Carrie Brownstein, changed their collective approach to songwriting. Brownstein’s explanations of the inner-workings of one of indie rock’s most indispensable bands were thoughtful and enthusiastic. The Woods is easily their most challenging record to date — but I believe it is something that will be eagerly embraced by longtime fans as well as new listeners. While Brownstein, Corin Tucker, and Janet Weiss may be treading new ground with their latest material, they’ve not forgotten nor abandoned their own personal and musical history. Rather, they have created music with a keen sense of building upon and complimenting everything that has come before. For your new album, I noticed that you not only changed from Kill Rock Stars to Sub Pop, but you also enlisted the services of Dave Fridmann as a producer for the first time. Do you feel that the label and producer changes have allowed Sleater-Kinney to evolve musically in a direction that wouldn’t have been possible without those changes? It’s hard to say whether, psychologically, that contributed to a newfound sense of freedom and a feeling that we were able to “get away” from ourselves, but we definitely desired a sense of perspective. I think when you’re a band for a long time, you almost feel like you know what you’re capable of, and that things have become sort of predictable, and you’re almost a little bit sick of who you are! (laughter) And you know, it’s kind of good to put yourself in a new, slightly uncomfortable position, I think, as someone who creates music or art. Sometimes it helps to just kind of shift the lens a little bit, and allow yourself to feel that you’re in a new place. So I do think that was part of the impetus of leaving Kill Rock Stars; I liken it to a married couple that’s just really content, but everyone’s like, “Oh they, never leave the house!” You know, everyone thinks they know what they do all the time: “No, they’re just at home, I’m sure they’re just watching a movie tonight together, they never go out!” (laughter) It’s great, we love Kill Rock Stars! It was absolutely harmonious, and in some ways we could have kept doing that for a long time. It [was] important to us that we could feel like we could stretch our legs a bit. The songs we were writing were feeling kind of urgent, a different feel to them…so we were ready to make a change. The same [goes for] working with Dave; I think that we wanted somebody that didn’t really have a sense of our history. When we worked with John Goodmanson, he came from the same background as us: he went to college in Olympia, he recorded the bands that were on the label with us, and sometimes when we would want to do new things, he would be like, “oh god, everyone would freak out if we did that, we can’t do that!” Whereas Dave had no sense of that at all, and just wanted to jump right off the ledge with us. We really needed that. Did you all make the decision to leave KRS and work with a new producer soon after the release of One Beat, or was it decided more recently while you were working on new material that you’d like to move on? Actually, we left Kill Rock Stars long before we knew what we were going to do. We left about six months to a year after One Beat came out; we just sat down with Slim [Moon, owner of Kill Rock Stars] and said, “We don’t really know what the future is, but I think we’re gonna do our next record with someone else.” In fact, so much time passed before we figured it out, that Slim actually called us and was like, “Hey, we’re interested in putting out your record!” as if he was courting us brand new — like, we really didn’t know what we were going to do! We had two people that we’d worked with for years retire — our booking agent and our publicist — and they were really part of the larger family of Kill Rock Stars for us, so we kind of felt like we were floating out there in the ether. And there’s only one song, “Entertain,” which we had about two years ago — but everything else was really just written about six to eight months before we recorded it. So you all truly did take time off. Yeah, we did the tour with Pearl Jam, and then we went back and did East Coast dates, and West Coast dates, and it just seemed to kind of go on and on! (laughter) And it wasn’t until we stopped doing that that we were able to, you know, think about [new] songs, and that’s when we started looking for a label and talking to labels, when we realized that there was going to be another record. I’ve been reading as much review material as possible for the new album, and after a while it seems like each review is an echo of another, stating that The Woods is so much more aggressive and “sludgy” than your past recordings. When I finally heard the record I could see how critics might state that; but in your perspective, did you collectively take a more sonically aggressive approach to writing your latest material, or is it something that just came out of you in the studio with the new producer? Well, in addition to “Entertain,” which had this kind of forward-moving energy, the second song that we knew were going to keep for the record was “Let’s Call It Love,” and that was a pretty intense bar to set; I mean, Corin’s vocals in the chorus on that song are very unhinged. We were really pushing her to go to a place that we knew she could go, but that she hadn’t really gone to — a really dark, kind of screechy, almost unstable vocal delivery that was just really free and propelling the song. So we knew that these sounded different, and that they did have a darker, very raw energy to them, so that set the stage for the rest of the songs. We didn’t necessarily want them to match that song, but we felt like that was the emotional tenor of the record, this place where there was a lot of uncertainty and there were things that were really unsettling. We knew each song had to have an element that explored that, either lyrically, or emotionally, or sonically. Just a place of danger and uncertainty and seeking out answers in that context. That’s how we approached the songwriting. We sent Dave the demos and then went to the studio; he really wanted to capture the kind of energy, rawness, and some of the aggression in the songs sonically, and he wanted to do that in a way that was really pronounced. He didn’t want it to be a subtle display of hurt, anger, or elation — he wanted the emotions to really reach out of the speaker and hit you on the head. We were interested in that approach, in having something that wasn’t subtle, but complex. In an interview with Entertainment Weekly, I read a quote by you saying that, “We don’t sound like some ‘80s band, so we don’t fit in, even with indie and alternative music being huge again.” Then I read the lyrics to “Entertain” [from the new album], wherein you state “You come around looking 1984/Nostalgia, you’re using it like a whore,” and “Where’s the black and blue?” Generally speaking, are you frustrated with a lot of what’s going on in popular “indie” music today, that perhaps it’s popular more because of co-opted style, rather than innovative substance? I get about 100 CDs per month and it is kind of laughable when you hear the same thing over and over. There are definitely a handful of bands that I can’t tell apart. But I think, “Entertain,” moreso than specifically just being about music, is more [about how I feel] the way things are right now. Everything is fodder for entertainment; everything falls under the entertainment category, whether it’s politics, or our own lives on reality TV, just anything is repackaged for our consumption as entertainment. And when there’s a conflation of that — when things that are usually supposed to be serious, or complicated, or even dynamic are all funneled into this reductive entertainment category — I have to question where art fits into that anymore. And I feel like, at that point, the artist’s responsibility is to make something that’s ambiguous and complex. I think that [“Entertain” is] more about that idea, in general, calling into question any of our (including my own) sense of entitlement in terms of wanting to be entertained, wanting everything out there to be repackaged in a way that is easy to swallow. It’s not just about, “oh, indie rock’s crap!” That’s kind of separate from that song, the fact that I’m frustrated with a lot of music! (laughter) There are a few lyrics pointed in that direction, but the whole intent was more of the broader [scope] that I was just talking about. You were mentioning the politics of Gang of Four, and how important you felt that to be. Is your music as much an extension of your politics as ever, or do you find that, sometimes, politics make you feel constrained? That’s actually what I meant, more or less—the label, the sentiment of “being political,” rather than actually [being restrained by] trying to write political songs. I think that, in terms of politics, we made One Beat, which was a much more strident and pointed political record, in terms of the lyrics…and this record to me — because of some of the things I was talking about earlier — feels like just as much of a statement, except in a much different way… [The Woods] does certainly take into consideration what we’ve done before, but hopefully pushes it further, and I think there are a lot more musical sentences on this record than just mere phrases, with the solos and things that are just improvisational — those are some places that we wanted to go that weren’t really on the other records. I normally don’t ask rote questions along the line of “Got any good tour stories?” but I also don’t talk to many members of bands who’ve toured with Pearl Jam! So I have to ask, what was that like touring with them, and more specifically, how were you received by their fanbase? It seems like it would be a totally different venue for you. First of all, the band, they are very generous. They really made it so easy for us, and they have a wonderful crew, and they themselves are just really nice people. Yeah. It’s very weird to tour with a band that’s so much bigger than us. It actually has quite a bit to do with how we ended up making the record that we did, in the sense that, after almost a decade of playing music, you’ve become accustomed to your fanbase and their reactions to you live, and you know what to put in the setlist and how people respond to certain songs… If you’re having a show that’s not amazing, you can still rely on the audience and hopefully get to a place that you’re having a hard time getting to [on your own]. When you play to an audience that doesn’t know you and, in some ways, might feel antagonistic toward you — I mean, I remember going to shows when I was younger and just waiting for the first band to get off! We really had to refocus and turn inward again, and in some ways we just had to prove it. It’s a pretty amazing place to be in after nearly a decade, to feel like you have to prove to people that you’re worth listening to and worth watching. And [regarding] the antagonism, it goes along with what you were saying earlier about working outside your comfort zone; recording with a new producer for a new label, [following a tour] in a whole different capacity… It’s just one more challenge you’ve posed to yourselves, it seems. But then all of a sudden, we’re doing something where they didn’t know what was going to happen — we didn’t know what was going to happen, and we really realized that we loved those moments, and those were the kind of moments that were really inspiring to us. A lot of the way that we approached the songwriting ended up being from that perspective, where we started with something really loose and freer in structure, and slowly built the song out of that — whereas we used to have a song that was really fixed, and it would become a little more unhinged live. So we kind of reversed the writing process a little bit, and I think the Pearl Jam tour has quite a bit to do with that. Yeah! Well, I hope you don’t mind or dread questions like this, but from a “historical” aspect — after being in Sleater-Kinney for 11 years — in your eyes, how has the riot grrl movement and punk feminism evolved over the length of your career? Can we even talk about “riot grrl” anymore, or do you feel like that’s a term applicable only to the politics of the 1990s? Well, I feel like it’s a historical term! I guess I don’t really know what it means when people put that term in front of our band now. I feel like the legacy of riot grrl and the marriage of feminism and politics with punk rock has had a long, lasting effect, even in ways people don’t really see right away. I definitely feel that sense in the Northwest, or other places I go. You kind of just forget that there was a time…you just take for granted that that even happened, in some ways; that people really made a concerted effort to really claw and scratch out a space for themselves in scenes and in communities, and there definitely was a time when that felt urgent — the acknowledgment of certain politics that felt crucial. I think there were things that were really unsophisticated about it, and that’s true of any movement that’s spearheaded by people who are 18! (laughter) And I think that the people who were in that movement continue to incorporate all different kinds of politics in their work. I think it’s had a positive effect — I don’t know about the whole “how it’s evolved” [aspect] in general over a decade. I do feel that people — at least we — have tried to not really get away from the label, but…we only just ask for the same neutrality that anyone is afforded—that your identity, your art can be fluid and can be viewed from different perspectives. We’ve never asked to transcend gender or escape it, but only to just have that sense of freedom. That the possibilities of this band are endless. Have you ever felt obligated to serve as role models? Is it something that you’ve sought to be? And I don’t mean that to be gender-specific, I just mean for musicians or artists or people in general. Well — I try to live an honest life! And I try to make art that’s interesting. I guess, ultimately, it would be great if people were picking up Sleater-Kinney albums instead Britney Spears records, although she has some good hit songs! (laughter) You know what I mean? You hope that…as much as I don’t want to be that “huge,” you kind of hope that people realize that there are other options out there. But I don’t really see myself as a role model — I think the best thing to do is just try to make art that’s interesting or is challenging. Ultimately, things I was inspired by when I was young weren’t necessarily overtly political, but they meant something to the people making it. Even just listening to the Ramones or the Clash — who were political — or any band or artist, no matter what medium, who is saying something that is interesting and passionate — they’re as much of a role model as anyone.